The Neurotology Fellows Award was established by the ANS in 1996 to reward scientific excellence. The award has been generously endowed through royalties received for the textbook Neurotology, Mosby Publishers, D. Brackmann and R. Jackler, editors. 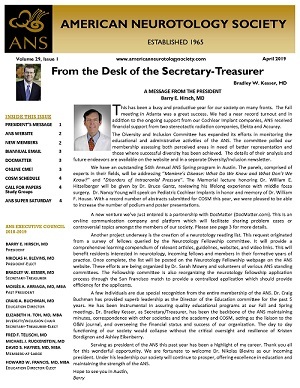 One or more awards of $500 is intended to subsidize travel expenses incurred while giving an oral podium presentation at the ANS Annual Spring Meeting. Applicants must be full-time participants in an ACGME approved Neurotology Fellowship. In addition, the Fellow must be both podium presenter and first author of the paper submitted for publication. The material presented need not have been performed during the Fellowship year; it may derive from earlier work performed during the residency or extracurricular research experience. A detailed abstract describing the proposed presentation is the minimum requirement. Additional material describing the work-in-progress in greater detail may also be submitted for consideration. While a mature manuscript is helpful at the time of application, it is not required. Award recipients are expected to submit a paper suitable for publication in Otology & Neurotology one-month prior to the meeting. The abstract must be selected for ORAL presentation to be considered.